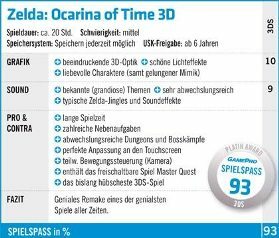 GamePro Germany is the first to release a review of the new 3D Ocarina of Time. Their verdict was 93%, earning it a platinum award. This little summary box of theirs, which is fully translated inside, has nothing negative to say about the game. That leaves me wondering, why 93%. While that is a good score, it’s a good score for common good games. Ocarina of Time should be getting much higher, like, above 96% minimum in my opinion. This either means that somehow the remake is worse than the original, which I doubt, meaning that it must be getting marked down for being a remake and thus, obviously not as revolutionary. Shame. The mention of funny facial expressions makes me think of the Wind Waker and Twilight Princess. 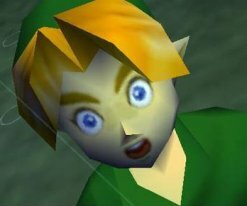 The original game had some decent expressions, such as Link’s priceless surprised look, but the graphics didn’t allow them to be entirely pulled off. Looks like they’re perfect this time around.